Our 3 Day Trip to paradise on a boat with 8 children and 5 Adults! 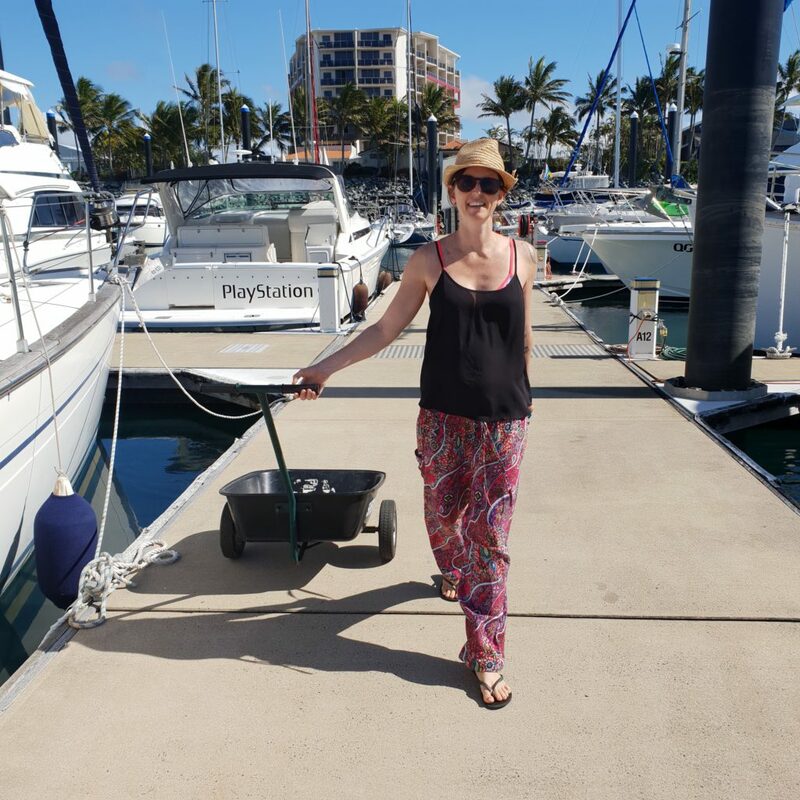 Off to Sail the Seven Seas, well the Whitsundays! Day 2, Our First Proper Day of Fun! 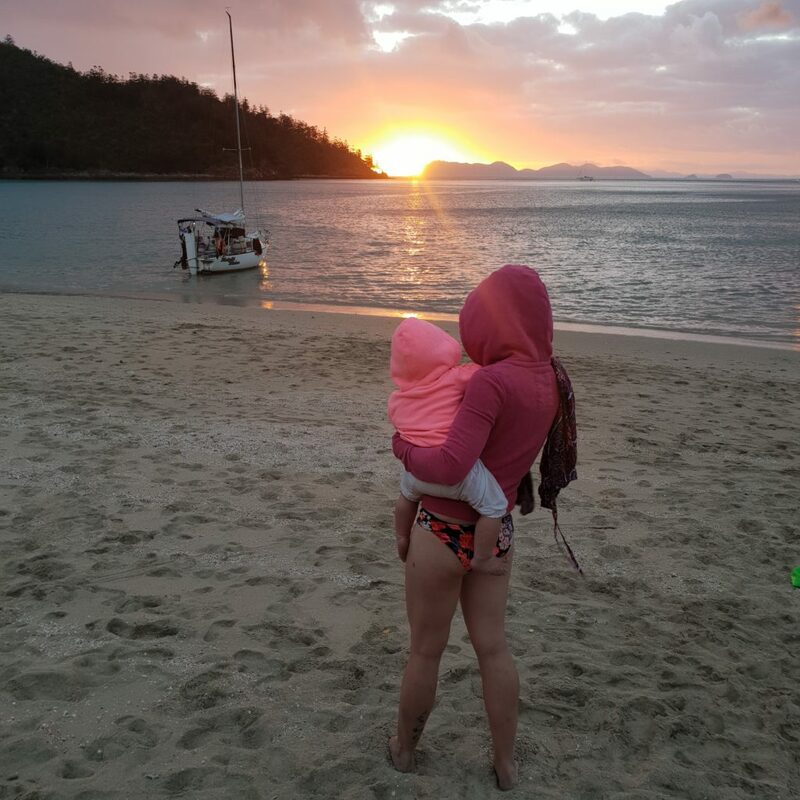 Hanging Out in the Whitsunday Islands is the Best Lifestyle you will Experience! 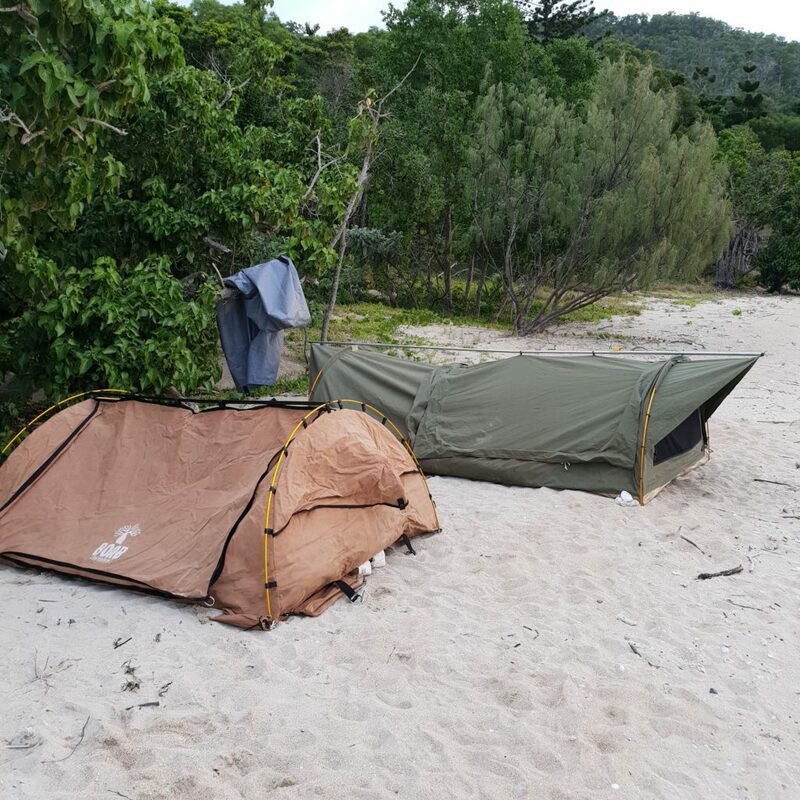 With another day over it was time to set up camp once again on another beautiful untouched island. Today was the Fishing Day! It was now time to head to our final destination, one more island then home! Fun times Can’t last Forever! Sounds like a lot of people for one little boat doesn’t it! Well, it kinda is but somehow it managed to work ok without too many hassles or accidents. 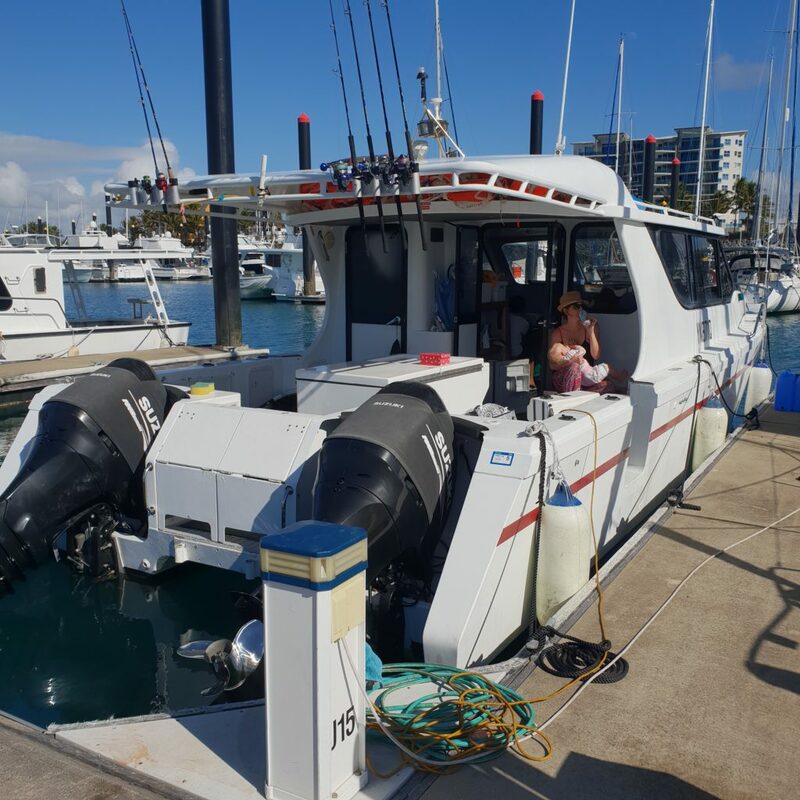 The trip began on a beautiful winters sunny day in tropical north Queensland at the Mackay harbour, our family of 6 arrived at the marina at about 9 am and began the loading of the boat with all our supplies and toys for the next 3 days on the water. 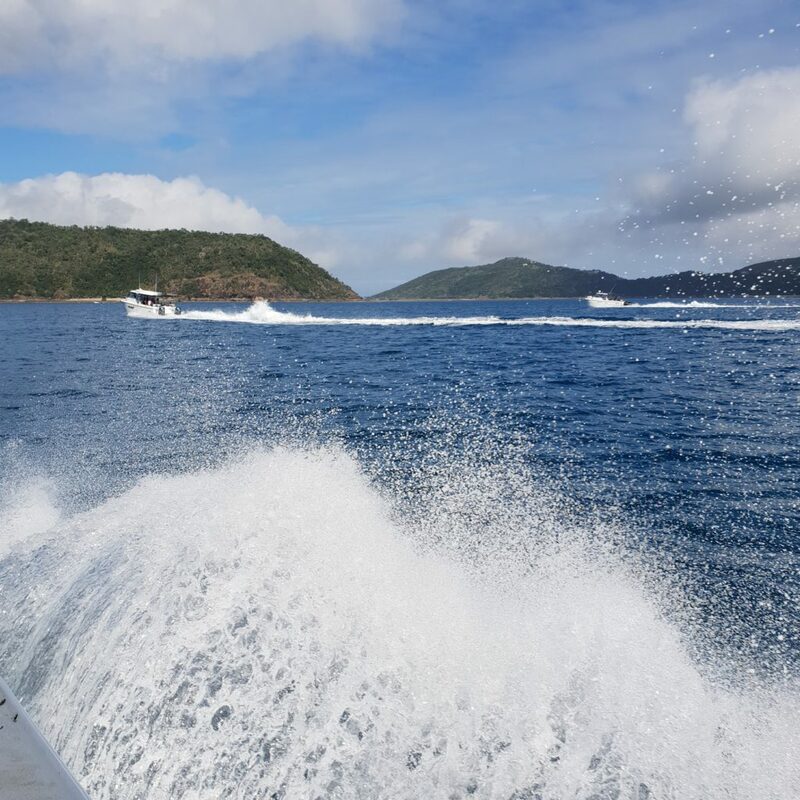 Our children range from 1 – 8 so you can imagine how difficult it is to keep everyone in line while making our way to the boat mooring which happens to be almost the furthermost berth from the gate! We packed light taking only 1 standup paddleboard, some warm clothes for night, some swimwear, food and most importantly, beer! Oh, I almost forgot the heaviest things on the boat our swags for sleeping (Which is just really a tent and mattress in one). We fumbled along the pontoon walkway waiting for Mabel and Daisy as usual, while I struggled to carry most of our belongings. If you have ever been boating with a large family it can difficult making sure everyone is safe and not falling in the water, especially the younger ones. Once on the boat, we could now relax for a short while and crack our first beer for the day! Ahh, the weather was superb about 20 degrees and just a light breeze. Load food and drinks into cold boxes and fridges. Organise places for clothing to be stored. 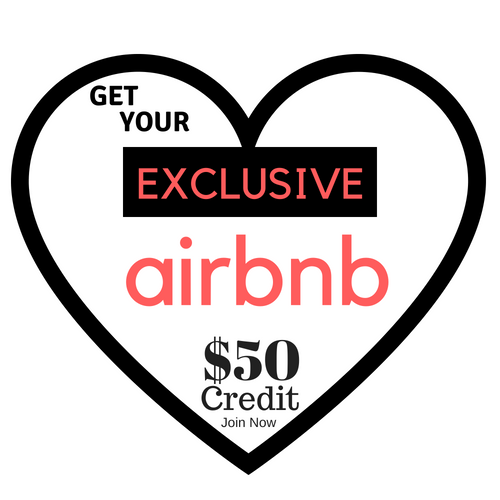 Tie down kayaks, paddle boards, and swags onto the roof. Fill tanks up with drinking water. Make sure the boat has fuel. Make sure the boat starts! Well, we got all the first items covered but the last item wasn’t happening, the boat was lifeless our captain was trying everything to get the boat started, but he just could not figure it out! So a bit of an anti-climax for us all, so what do you do in a crisis? Have a beer and enjoy the weather. Luke our captain called for help so until help arrived we had to entertain the children and feed them cold quiche. The problem with feeding the kids cold quiche was they didn’t really like it, so they would just sneak the small pieces of quiche into the water where the fish were waiting to eat it up. This was followed by cart rides in the marina trolleys they provide for loading boats, they loved it! Then Kris decided we would do some warm-up yoga for the boat trip, she began her routine with the kids following each and every move. After a while our great helping auto electrician had arrived and found the problem quite quickly, a couple of turns of the key and kapow we had action, the boat was alive! We didn’t have to give up after all and go home and go camping, hooray! Our boat was away, we were all excited and relieved that we were going to get to our destination, at last, the Goldsmith Island group of islands. The channel crossing was a little lumpy, but the 35ft boat we were in took it with ease, which allowed us to enjoy a few more beverages on the journey over to the islands. We had boarded the boat at 10 am and arrived at the island around 3 pm, so a bit later than expected but at least we got there in the end. We were meeting up with some good friends on the island who were sailing a 20ft trailer sailor called Knight Rider. As we came around the corner of the island where they were anchored right on the glorious sandy beach beside the crystal clear waters edge, it was completely magical and the way I imagined it. 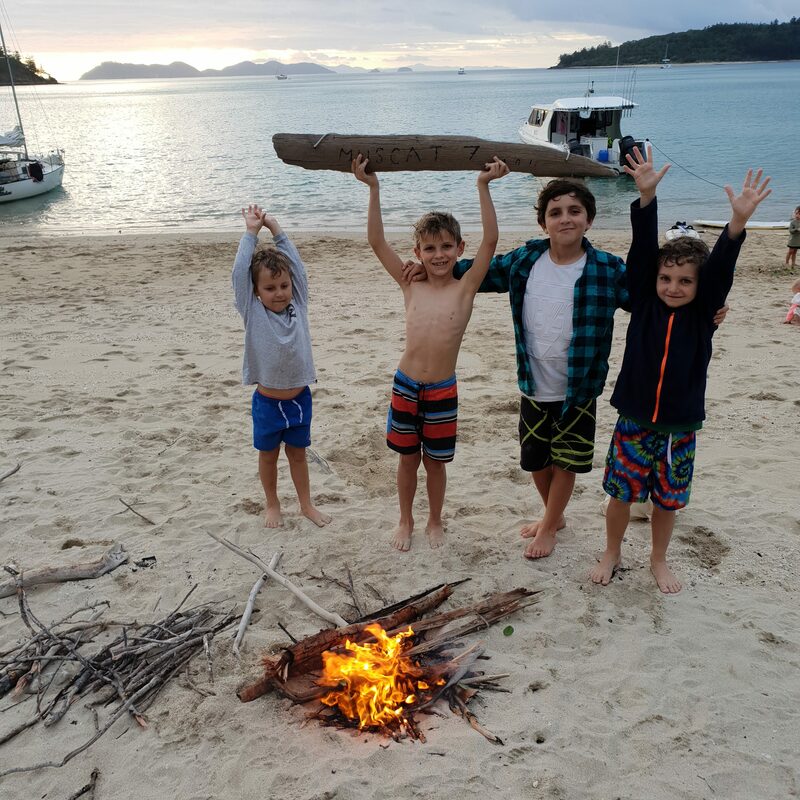 The 8 kids and 5 adults all began disembarking the vessel to enjoy some beach time, kayaking, paddle boarding, swimming, rope swings, collecting shells and collecting wood for our sunset fire on the beach. The afternoon was amazing! One of the best afternoons I have had in a long time. We played and had a ball for a few hours until the sun set behind a gorgeous island in the distance, what a sight. 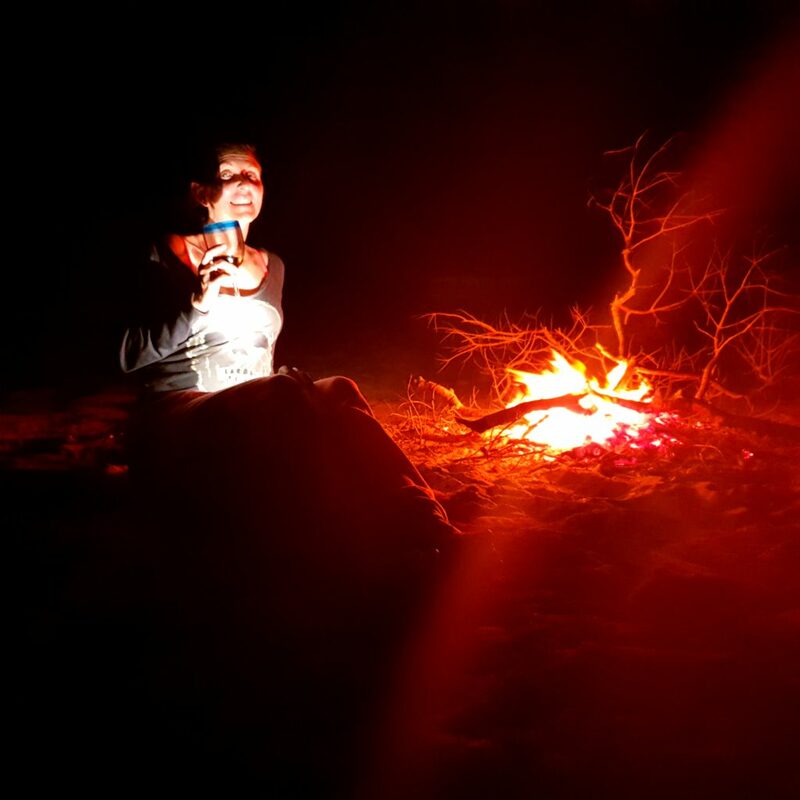 The boys had really created an awesome fire for us to sit around and chat while enjoying some delicious beverages on the beach. 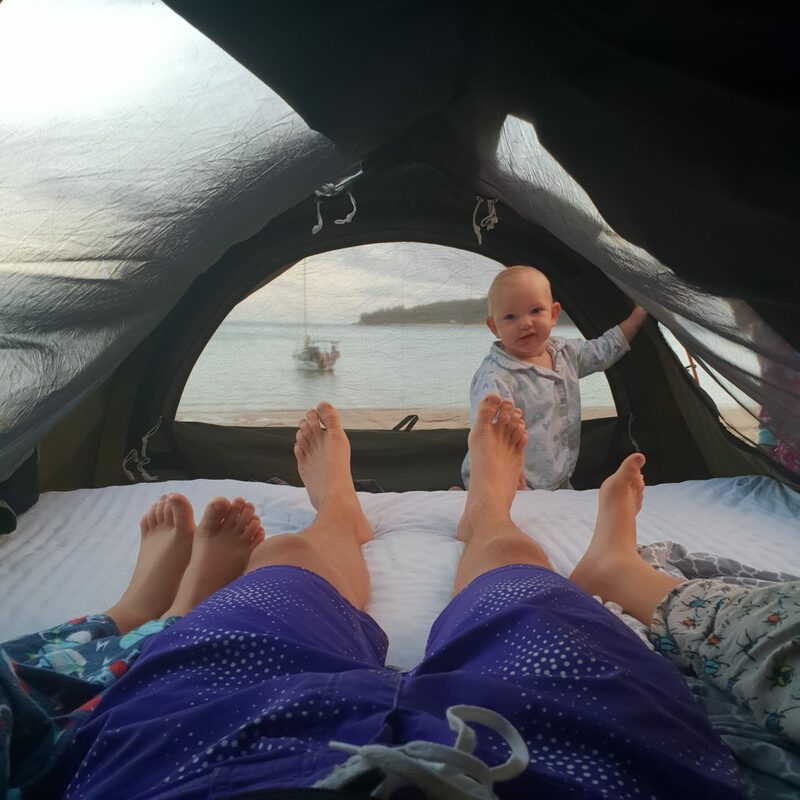 Kris, I and our 4 children had to sleep on the beach in the swags we brought, they were pretty easy to set up. Our configuration was going to be all the boys in one tent and all the girls in another, which we hoped would work out perfectly for the entire night. Dinner was made on the boats and we enjoyed rissoles and fried rice for our first night of the trip. The kids were going crazy all night, they had glow sticks and were all playing red, red rover for ages until dessert was served, marshmallows roasting over the open fire! It was time for bed, my family headed for the swags while the 2 other families boarded the boats to get some much-needed shut-eye. Our tents weren’t the biggest on the planet, I was sharing with my 6-year-old and 8-year-old, so it was a tight fit I must say, no room to spread out and we had some sheet problems which were to be expected, also I forgot to get some water to have in the tent for when we got thirsty. Throughout the night it became a little warm due to having two hot bodies beside me radiating 37 degrees all night, which made me even thirstier. I finally got some deep sleep but was awaken by some pesky crows, but it was worth it because the view out of our tents was amazing. As I looked out of the swags I noticed our boat was gone! Great now we are stranded, without water or food, for how long we will not know until later. Luckily for, us our other friends in the trailer sailor were still nearby and managed to make us the best cup of tea which would get us through the morning. 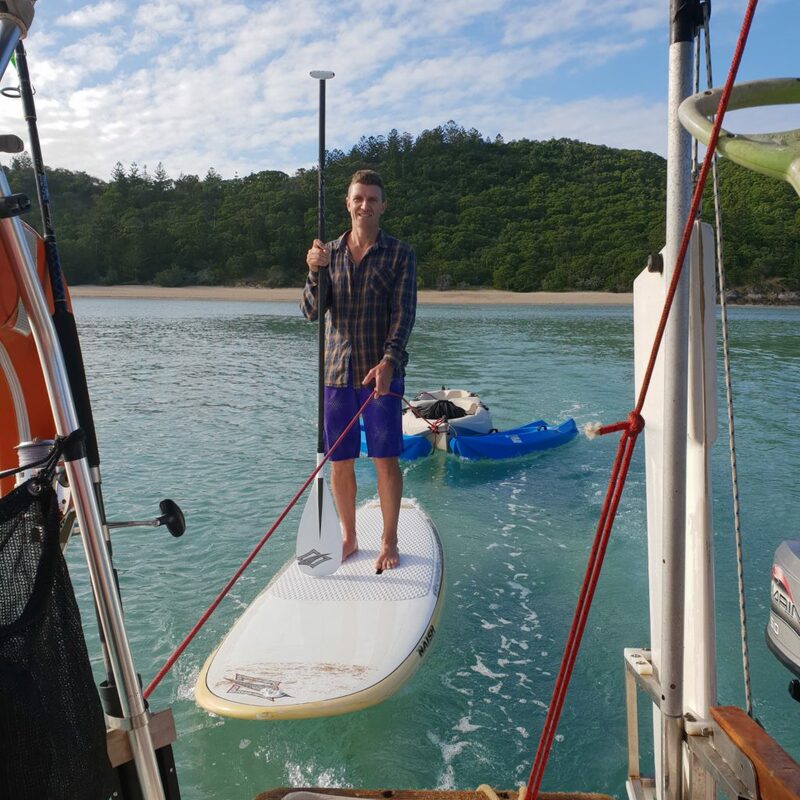 The Whitsunday’s are great, but the only major thing you need to look out for are the tides! They can rise and fall by 6 meters and happen in a 6-hour cycle, so if you have a big boat you do not want to get stuck on the sand or even worse the rocks, you could be stranded there for the whole entire day! 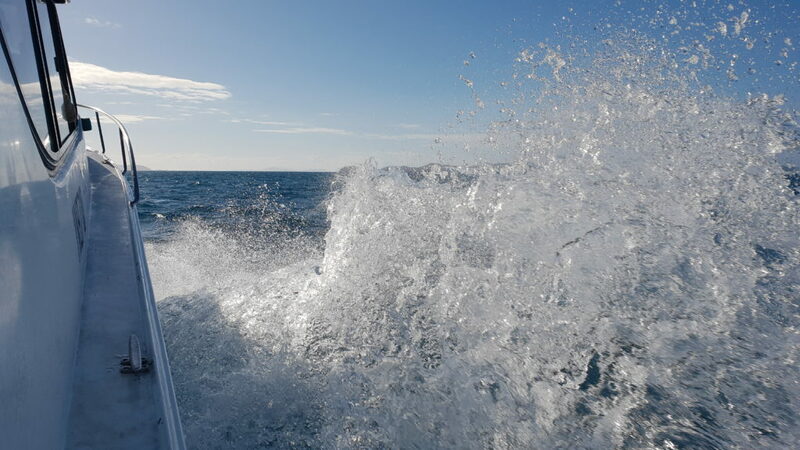 This is why our boat has left without us, to beat the lower tides, for us to meet up with them we had to transfer our gear from the trailer sailor to our main boat around the headland, which was sitting in deeper water. Finally, we were aboard and could have some breakfast, the water was so blue and refreshing, so everyone aboard the boat was fishing, swimming, and paddling in turquoise waters and really lapping up the sunshine. It was so nice, winter in north Queensland is the best, it is just like summer is in the south or in the Mediterranean. We decided to explore the rocks on the island, and hunt for some oysters on the rocks, delicious! After some fun in the sun, it was time to say goodbye to our friends on the trailer sailor they were heading north to the famous Whitehaven beach for a couple of days. 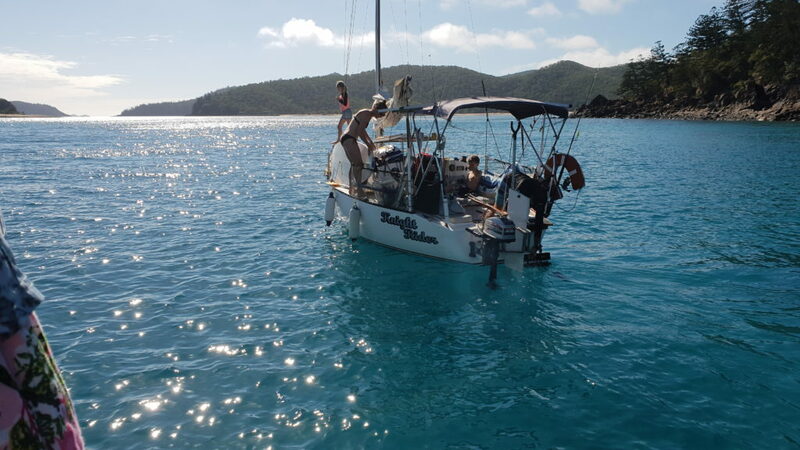 When you sail around the Whitsunday islands, you feel like you are in another world miles from your normal world. 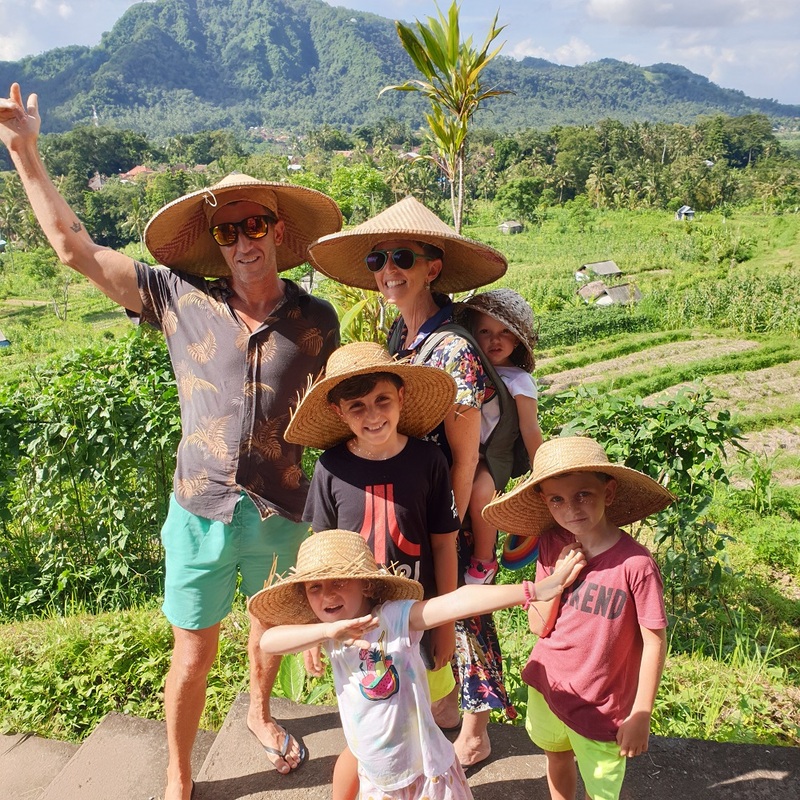 You get to experience amazing new lands, explore almost untouched beaches, swim in the pure waters, see whales and amazing wildlife, see magical colourful coral and try and catch some exotic fish to eat for dinner. It is really amazing and a must do experience on anyone’s bucket list. 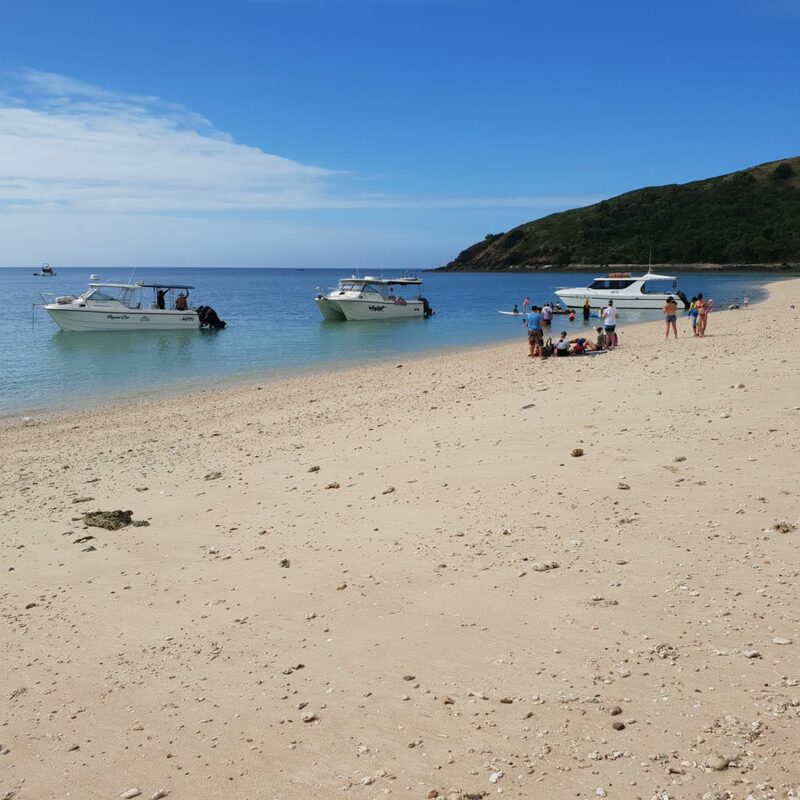 We continued on in our 35ft vessel exploring new beaches and islands, swimming, paddling, fishing, eating great food and having the odd beverage to quench our thirsts. The days go so fast out at the islands and they tend to blur into one, I guess this is island time! We set up once again and got a nice warm fire happening, just my wife and the 4 kids this time and a glass of red wine, life doesn’t get any better than this! So another night in the swags and another night sleeping with the boys, this time Dash, and Jasper were sleeping head to toe and I had to fit in the middle on an angle. The sheets didn’t quite cover us all, so it was a little uncomfortable but luckily I had had a few wines and wasn’t affected too badly. We awoke in the pre-dawn stillness to the sound of starting engines, it was time to pack up the swags and get onto the boat before the tide started to go out too far! We were tired but we had to move, so one by one we had to transfer our children onto the mother ship, wading through water early in the morning, it was a little cold. Once all the kids were on board we packed up the swags quickly, while being attacked by some local mosquitos, which made it quicker to do and proceeded to get aboard the boat and escape the bay. After cooking up a massive feast for champions which consisted of eggs, bacon, steak, sausages, and beans we started our fishing adventure. The aim was for each member of the boat to catch a fish, well, try and catch a fish. 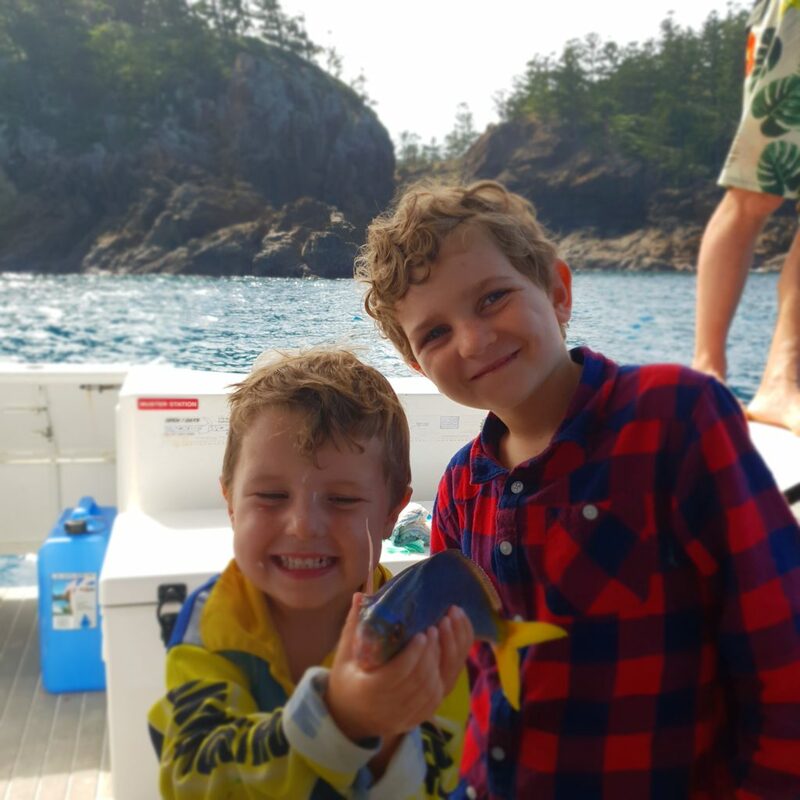 Our Captain and expert fishing guide Luke typically caught the most fish which were edible, the fish he was catching was coral trout a really delicious fish. While the rest of us kept catching batfish or sweat lip that was too small to keep, so we would have to unhook then and trow them back for another day. The kids got into it, but the only problem was each fishing rod was worth $2000 dollars and you didn’t want to lose these so we would have to really watch them. Also, you know what kids are like! They love fishing for a few minutes then they get bored and decide to do something else and leave their lines and hooks all tangled on the deck! We ended up with a pretty good haul of fish thanks to Luke the fishing pro! After cleaning up the fish guts and old bits of bait off the deck we went full throttle to our last destination St Bees Island. Here we meet up with some friends who owned some very big boats and enjoyed some fun and games on the beach. 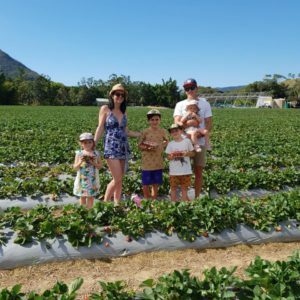 The kids had a ball – there must have been around 30 kids and 12 mums and dads all enjoying the beautiful weather, kids kayaking, paddling, swimming, soccer on the beach, exploring and some beers and nibblies. This is what makes life great, awesome memories and good times. 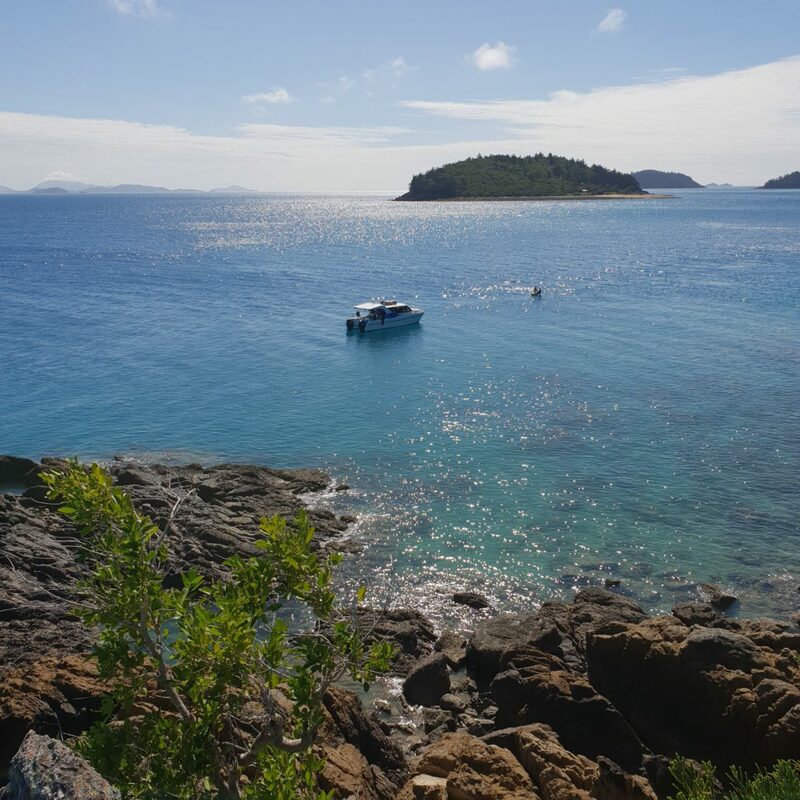 This is what the Whitsunday Islands are all about, once you take a trip around the islands once you will be forever hooked like a fish, and you will always want to come back time and time again. So it was that depressing time once again, home time, what goes up must go down. We boarded the boat once more and began our journey across the passage back to the Mackay Marina. It was so glassy and still, a dream run! There was a report on the radio of a whale caught in a fishing net somewhere off the coast, but we did not come across it or any whales for that matter, I think we were a little early for the whale season. 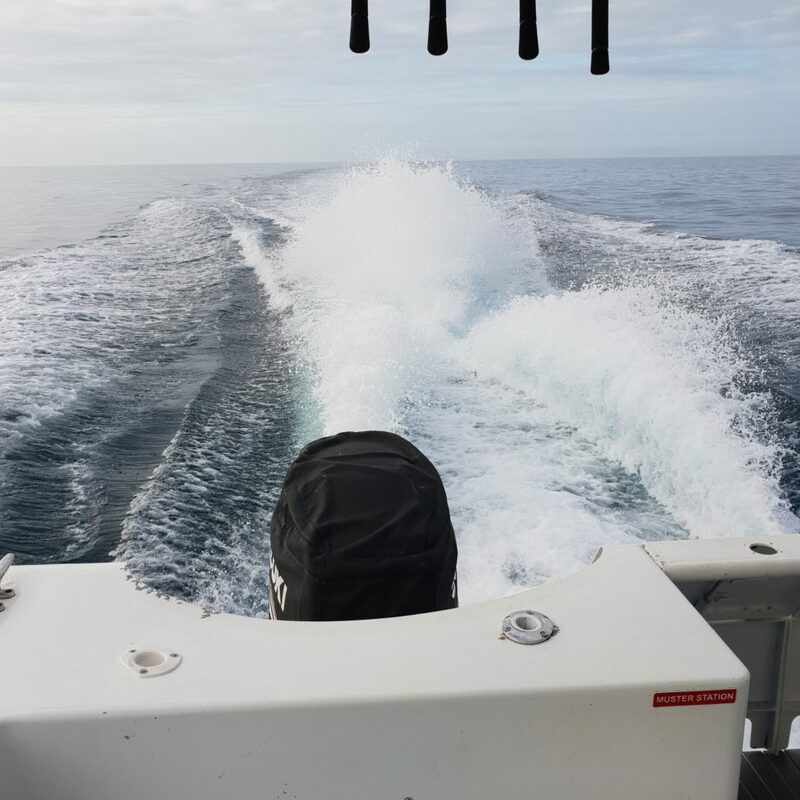 The wind was predicted to blow up to 30knots the next day, so we had to head back early so that we were not caught up in the rough seas that it brings, that is definitely not fun! 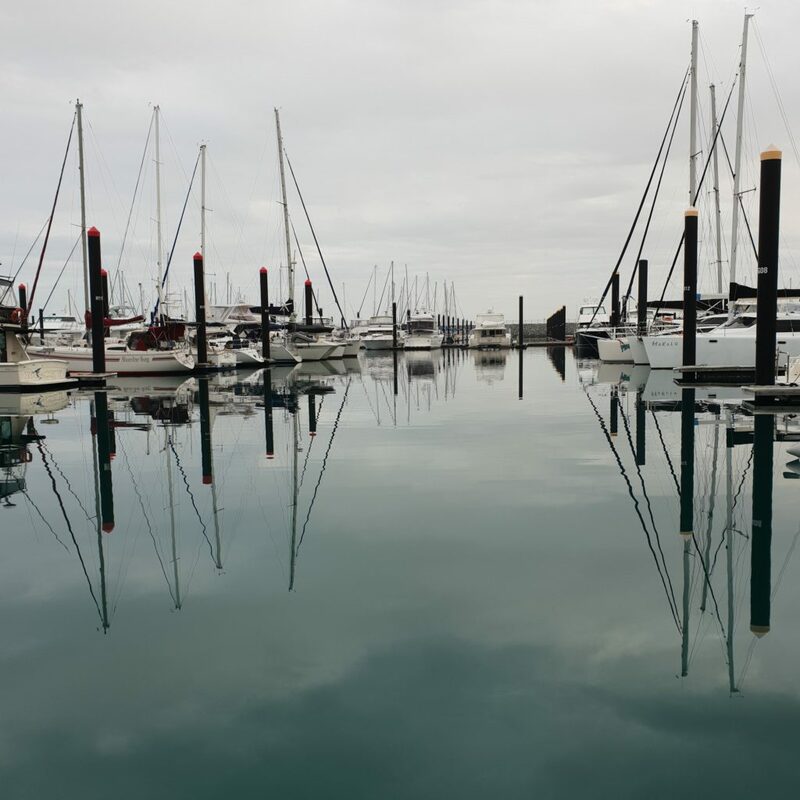 Once back in the safety of the marina we soon realized our Whitsunday trip was over and that reality would be back once we stepped onto dry land. We successfully managed to have no accidents with the children onboard, which is always a blessing and lost no one overboard which was great! Traveling on boats with kids can be challenging at times in such a small space, but the memories made out at sea are priceless. 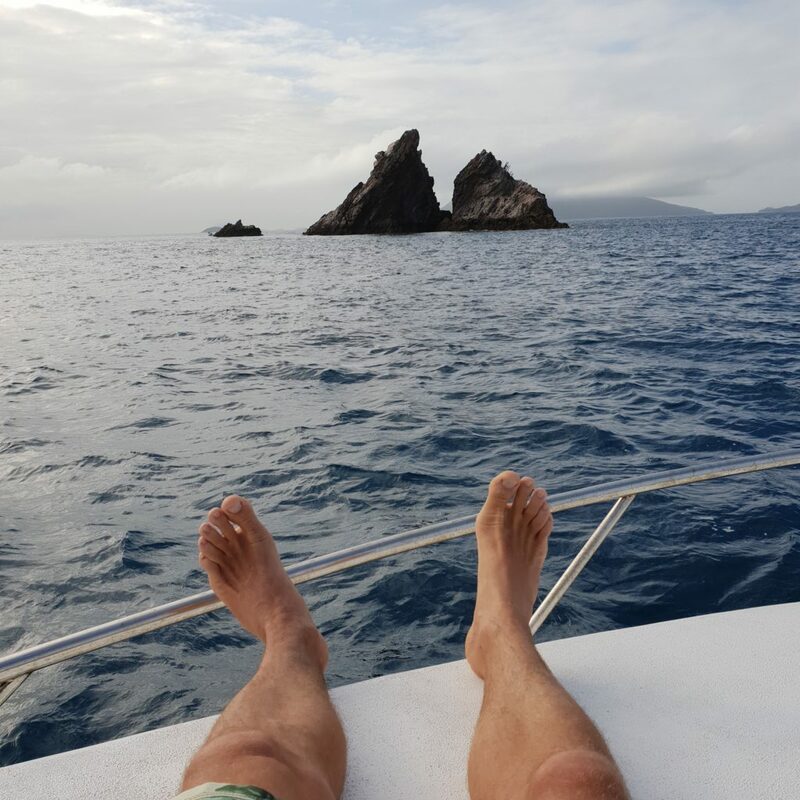 So if you want to really get away from it all and experience another side of life where there are no computers, cars or even people for that matter, I urge you to go sailing the Whitsunday Islands and explore what it has to offer your soul!